Transportation Costs > How Much Does an Ice Cream Truck Cost? How Much Does an Ice Cream Truck Cost? Ice cream trucks, as you may remember as a kid, are often spotted in areas where people congregate such as beaches, parks, public events or a busy residential street during the summer months. The most major asset — if you’re were thinking about starting an ice cream truck-based business — would be the truck. On average, be prepared to spend anywhere from as little as $10,000 to buy a used ice cream truck in okay condition with high mileage to as much as $100,000 for a top-of-the-line brand new ice cream truck; however, most purchases, especially if you’re purchasing used, will be in the $10,000 to $25,000 range. The cost of one, similar to that of buying a car, will depend on the type of truck, its condition, the features and geographical location. If at all possible, most recommend buying a slightly used truck with a freezer already installed to save the most money. eBay.com, for example, had hundreds of auctions ranging anywhere from $8,000 to more than $70,000. The SmartMotorGuide.com, an online classified website, had a pinch more than 300 listings at the time of this writing, with prices ranging from as little as $3,200 for a 1990 Ford to as much as $80,000 for a brand new Utilimaster Step Van. FoodTruckEmpire.com surveyed 35 ice cream truck vendors and found the average truck would cost $10,000 to $20,000, but this wouldn’t include the vehicle wrapping, customizing and freezers to keep your inventory cool. As mentioned, an ice truck may have to be wrapped/customized for the first time, or if the truck is in poor condition, it may have to re-done. The costs, depending on the size of the wrap and vehicle, can range from $2,000 to $5,000. A freezer, which is designed for an ice cream truck setup, can cost $200 to more than $1,500, depending on the size and where you purchase it from. Of course, buying an ice cream truck is just the beginning of your business expenses. Other expenses to think about include gas, insurance ($1,000/year), permits ($50 to $200), your inventory ($500~) and labor ($12+ per hour) if you needed it. 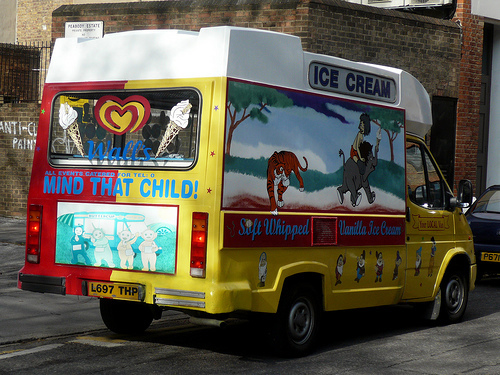 A Step Van, for example, is often converted into an ice cream truck. If you don’t mind customizing it on your own, it may cheaper to customize instead of buying on that’s already had the work done.